There's a cool new book on animation workflows called "Animation Insiders - Workflow Edition" that I think is worth picking up. 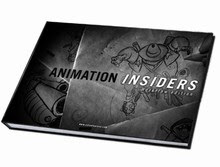 It contains interviews with 13 working animators who discuss not only their processes for creating animated performances in various media, but also the inspired stories of how they came into this career. Lot's of good advice for young and veteran animators alike. It's not on Amazon.com yet, but you can order directly from the publisher. Full disclosure: I am interviewed in this book as well (but I don't get royalties or anything). This looks really good, il have to buy it. By the way im a multimedia student at Nottingham Trent University, I'm currently doing an essay on why i want to do animation as a career and have chosen you as a practitioner to talk about, i could'nt find an e-mail for you so thought i would leave this as a huge comment sorry. I find your work really inspiring and just wanted to ask; what do you enjoy most about your job?... thank you for taking your time if you do read this. Cool, Just bought it. Been waiting for the release, thanks for the reminder. I love learning others, techniques. Joshua, you can find my email in the Contributors link in the green box on the bottom right of the blog. Oooh... This looks like fun. I've been devouring my animation books. Always looking for another good one. I just ordered it! Thank you for the great book!!! Do you have any idea how well this is selling? I looks very interesting and I can't wait to get it, but with everything turning to digital, and online it's hard to know where the best outlet for spreading the knowledge is these days in a way that you can actually pay for the effort. DVDs are becoming less common, books are turning digital or at least people are spending more time reading online than they are a book. It just makes you wonder what method will be the best way to present your story in a year or two from now. Perhaps an iPhone App? Hi Michael, I really have no idea how it's doing. You'll have to ask the author, Jeremie Noyer.